Our Early Years team provide a range of services and products to support you as a practitioner, whether working in an Ofsted registered Early Years setting in the private, voluntary, independent or in the maintained sector. Our team of consultants are specialists, covering many aspects of working with children aged 0 – 5 years old including language development and creating an outdoor environment through to toolkits that have been specifically written with the challenges you face in mind. We can support you whether you are currently working in a day nursery, a preschool, a crèche, a childminder in the home environment, at an out of school club, or a school. Our expertise is available whether you are a manager, a key person, a room leader or an assistant. Through our Early Years consultancy service we offer visits to individual settings to support development of the environment, review safeguarding practice and observe practice. To support the development of teaching and learning we can provide environment rating scale audits (ECERS), joint observations of practice with managers and modelling teaching activities. We have launched a range of new services specifically tailored to PVI settings. There are five packages available, designed to support continuous improvement and help sustain high-quality education and childcare to maintain a thriving business. The membership enables settings to access to a quality improvement forum and keep up to date. The consultancy packages enable PVI settings to plan a programme of support and spread the cost over a 12-month period by paying by direct debit. If you are new to Early Years and require some training to support further development and to expand your knowledge of the Early Years Foundation Stage (EYFS) and recommended good practice we offer training through the Young in Herts training and school training programmes. We also offer an online course aimed at developing the knowledge and skills of all Early Years practitioners across all types of Early Years settings. We can support you with understanding, implementing and embedding the statutory requirements of the Early Years Foundation Stage (EYFS), including safeguarding. If you are new to management, we offer programmes to support you to become an effective leader and manager. Link to Young in Herts training. For existing managers that may wish to develop their management style further through use of coaching, we offer a bespoke service. Overall, the team at Herts for Learning has a passion for development within Early Years and to give all children the best possible start in life. We look forward to having the opportunity to work with you towards achieving this. If you have specific needs, we would be very happy to discuss these further. Through our consultancy visits we can offer relevant support to meet the needs of your individual setting. 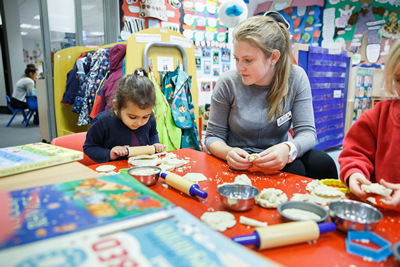 Our range of resources is ever-growing and written by practitioners with a high amount of experience and passion for the Early Years sector, working with children aged 0-5 years. simply follow the links below for further information. 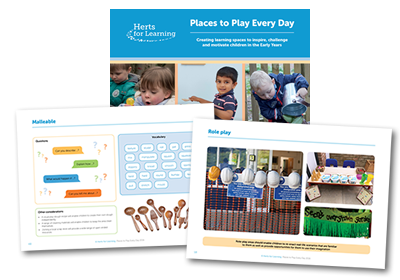 This range of publications will help you create learning spaces to inspire, challenge and motivate children and help you effectively organise your Early Years environment so that it invites learning across a range of contexts, indoors and outdoors. This toolkit has been designed to provide support and guidance on effective use of funding and provides sustainable ways to capture the positive impact of intervention. It centralises key information and research, signposts to further resources and provides a ‘one-stop shop’ for leaders and practitioners seeking tools to support planning, evaluation and guidance on the effective use of the funding for supporting disadvantaged and vulnerable children. Lively, engaging and active phonic activities to help develop early literacy skills. 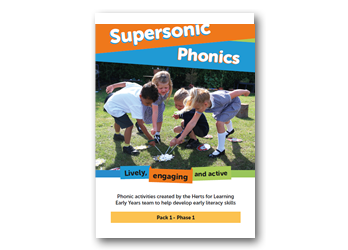 The Super Sonic Phonics are ‘easy to use’ activity cards designed to enable practitioners to structure active phonic sessions. 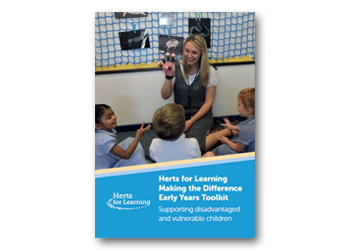 Available as part of the PA Plus subscription package which also contains access to a range of easy to use templates and guidance tools that will help staff at all levels working in the Early Years Foundation Stage. The Early Years Outcomes Tookit will help you to track different groups of children’s progress, to monitor the effectiveness of your provision and enable you to identify and plan for those children who need to make rapid progress. 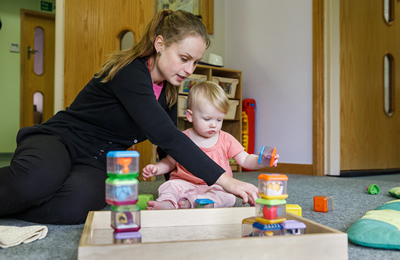 The Young in Herts training programme provides opportunities for practitioners to access a range of training to meet the requirements of the EYFS and to upskill, with the overall objective of delivering high-quality teaching and practice. For those early years practitioners who work in a school you may be interested in the school training programme. 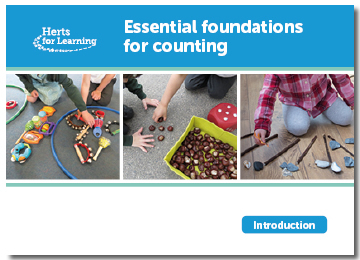 Don't forget you can complete our online course which is fully interactive and consists of slides, videos and animations to support effective learning. At the end of the course there is a set of multiple choice questions to complete to help you assess your understanding of the guiding principles of teaching and learning in the EYFS. There is a certificate on completion. Happy St. George's Day to all of you celebrating today! These services enable you to plan and choose the type of focused visit you need at a time convenient to you.